If you love before and after photos as much as I do, I have several projects in the pipeline that are going to have some really fun before and afters. Below, are two projects I’m currently working on that are almost ready for their “after” shot. This is a wonderful house in the rolling hills of Austin that has been a wonderful project to work on. Above, you can see that we painted the exterior brick and now we are pouring a new walkway and steps, as well as adding some planting beds. I also plan to add a couple other exterior touches that will really transform this exterior. This is a townhouse in the San Fernando Valley (Southern California) that needed a complete gut. 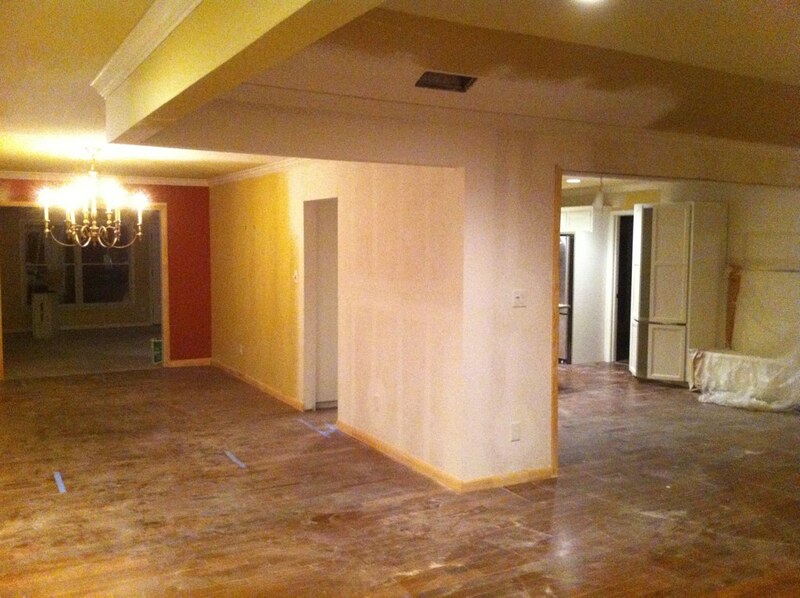 As you can see above, we removed most of the wall on the left to open up the space between the living room and kitchen. 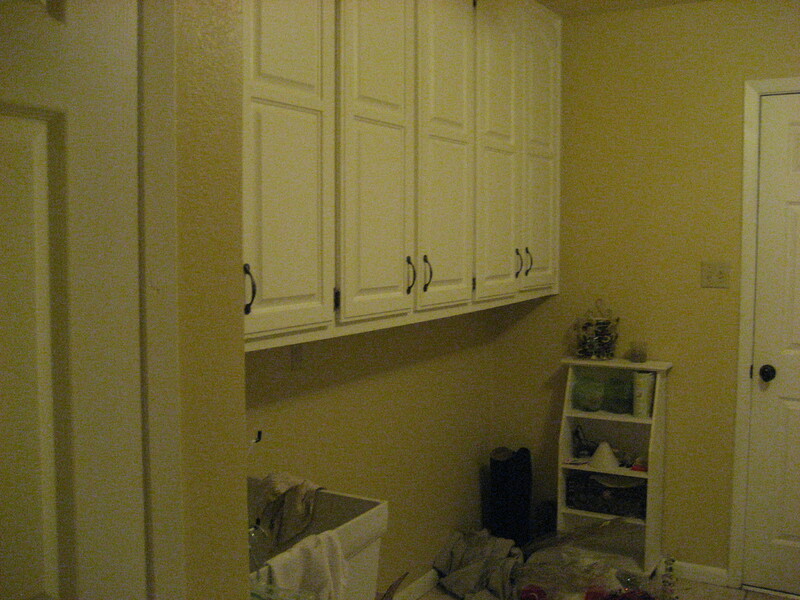 We painted the walls one of my favorite colors from Farrow & Ball — Clunch, and now are adding a kitchen from IKEA. I’m hoping to post the before and after photos next week, and many of you will not believe the transformation. 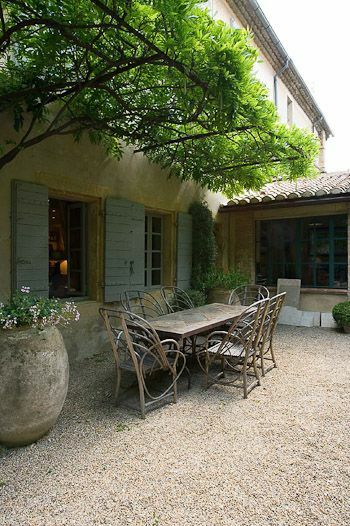 Like so many, I absolutely love the gardens in Provence! When I visited the region 5 years ago, I fell in love with this part of France including its gardens & slower pace of life. 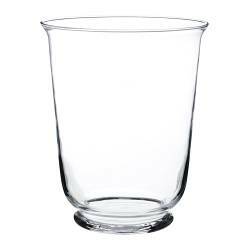 The beauty, simplicity, sophistication and disregard for contemporary ingenuity was beautiful to me. The effortless style drew me in and I tried to take notes of everything that appealed to me. 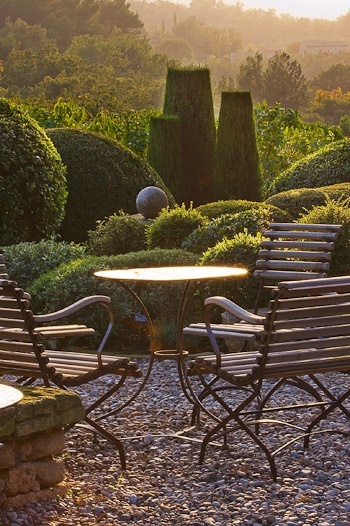 I particularly loved the areas in the gardens which were designated for eating or entertaining. The materials were so simple — an old farm table, rustic chairs and simple plantings all made up that certain feel that is so desirable for so many of us. 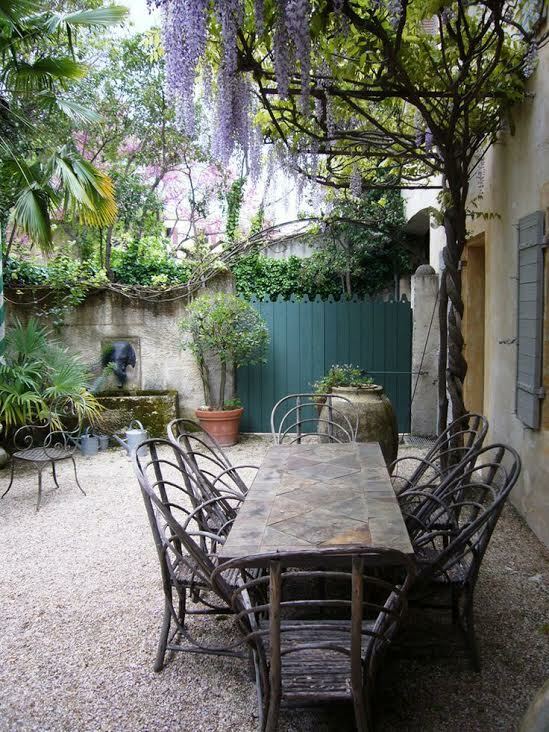 Therefore, while remembering my Provencal vacation, I thought I would put together some simple tips on how you could create your own little South of France right in your backyard. 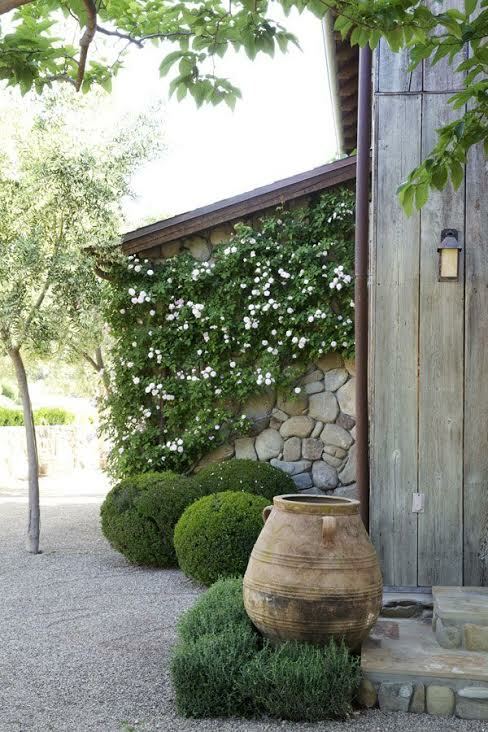 Although, many of us don’t have a charming French farm-house or the amazing Mediterranean climate we can still obtain “the look” in our own backyard. It’s relatively easy, all you need is some space and a couple of items. 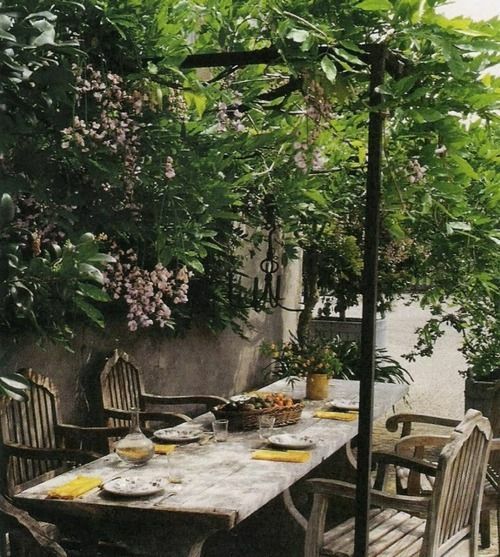 First, figure out the area in your garden where you are going to add this little Provencal nook — preferably a shady part of your garden. 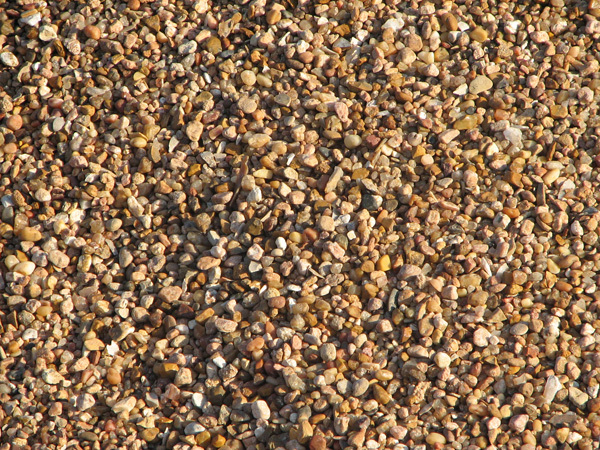 There are many types of gravel but the gravel usually used in Provence is similar to our ‘pea’ gravel. 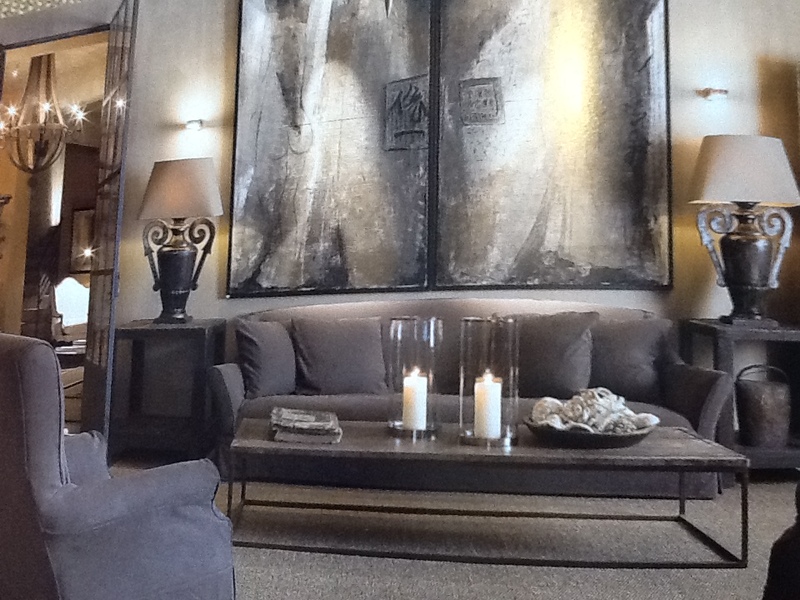 A place to sit and sip on a glass of Rose and enjoy a late lunch is always nice. 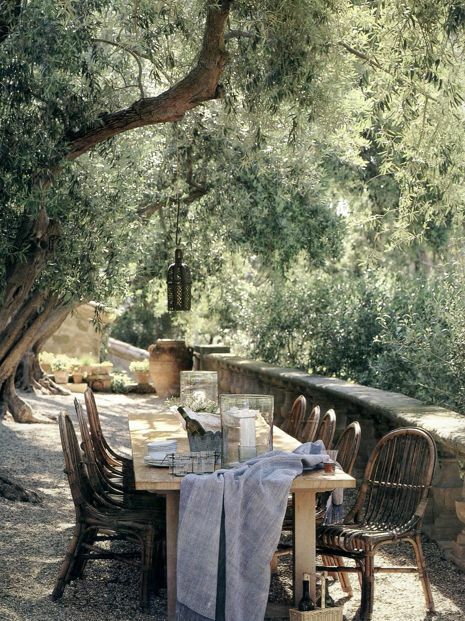 I like a simple picnic table and benches but it can be really anything. 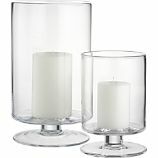 Places, like Restoration Hardware, Ikea and Pottery Barn offer some type of “farm” table. If you don’t want to wait years to get an aged look, try Craig’s list for a used (weathered) teak or picnic table. 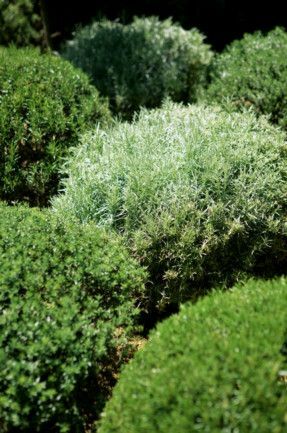 Of course, plants like Lavender and Rosemary are well know Provencal plants but there are tons more. Plants like Pittosporum, roses, salvias, and certain citrus are popular as well. If you don’t get full sun in your garden, or live in an area that doesn’t allow for you to grow Mediterranean plants then try plants that are similar. It’s really about working with the climate you are living in and using similar shapes and textures to Mediterranean plants. Also, these gardens tend to keep the plant list simple — using only several varieties of plants. Too many varieties and it becomes more of an English cottage garden. Your local nursery should give you the best advice on which plants would be comparable. STEP 6: POUR YOURSELF A GLASS OF RICARD OR ROSE & ENJOY! We all know it’s not really what you put outside but what you do with it or how you live in your space. Even if you only have a simple courtyard or balcony, the main thing is to take time with friends and family, pour a glass of wine or a cup of coffee & just enjoy the moment. 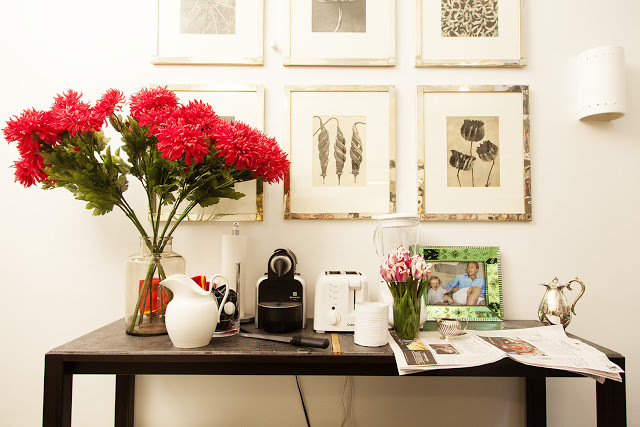 In the past I’ve been quite adamant about only using real flowers in a home. 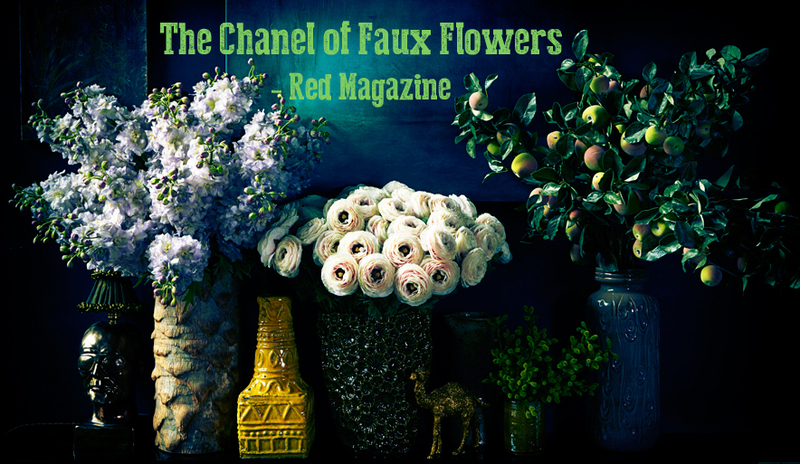 However, faux flowers have changed, and let’s face it some of us are just too busy to keep up with it all. A trip to your local farmer’s market or grocery store for fresh flowers before company arrives might not be realistic — the solution just might be some fake ones, why not? 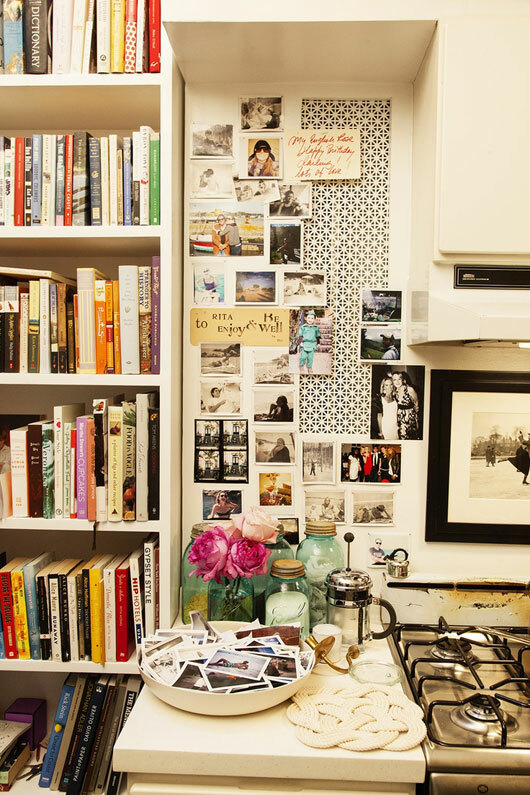 British Interior Designer/author, Rita Konig’s, home above with faux dahlias. 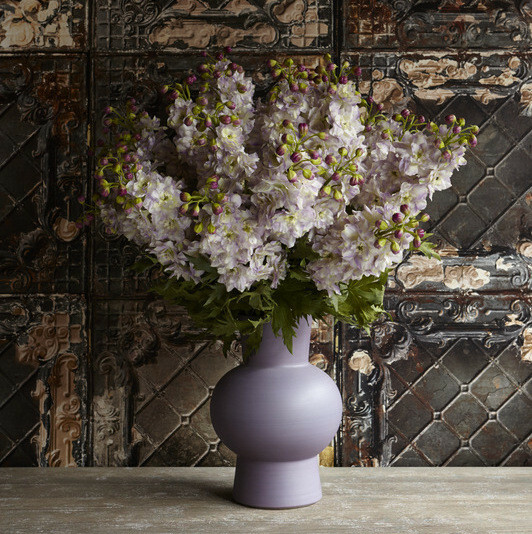 Abigail Ahern, also an interior designer, stocks lovely fake flowers in her London shop. Most local floral/craft stores carry faux flowers, as well as Ikea. The trick to using fake flowers is to use what would typically be in season at the time (more believable). 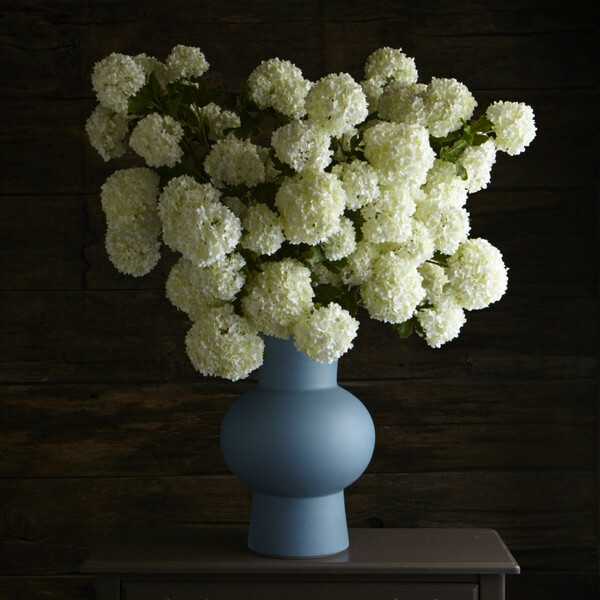 The brilliant thing about faux flowers is that they add a beautiful burst of color with little effort. Enjoy! 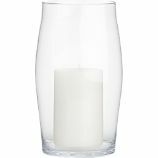 One of my favorite items to use in a home, that’s never hard to find or costly but totally makes a room, is the glass hurricane. 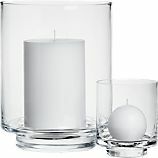 Whether it’s modern or traditional in style, it can bring a bit of warmth and sophistication to any room. 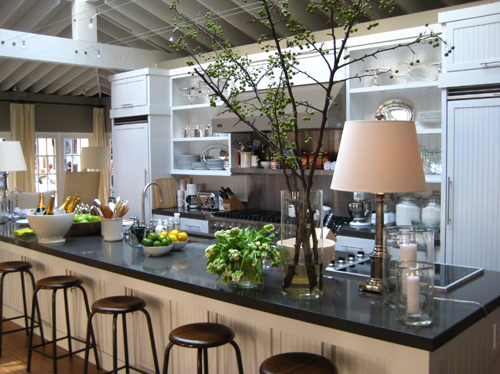 Of course fans of the Barefoot Contessa will know about the ones on her kitchen island. Lovely. 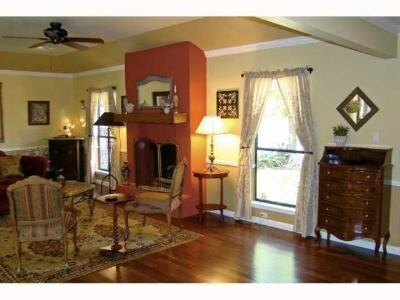 This part of the home is really overall “The Family Room”. 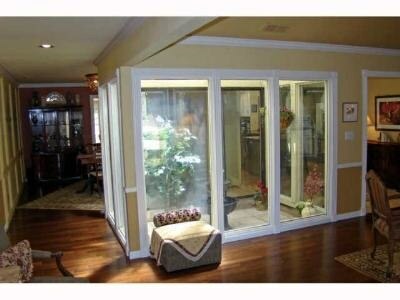 It’s probably where most of the lounging and hanging out will ultimately happen. 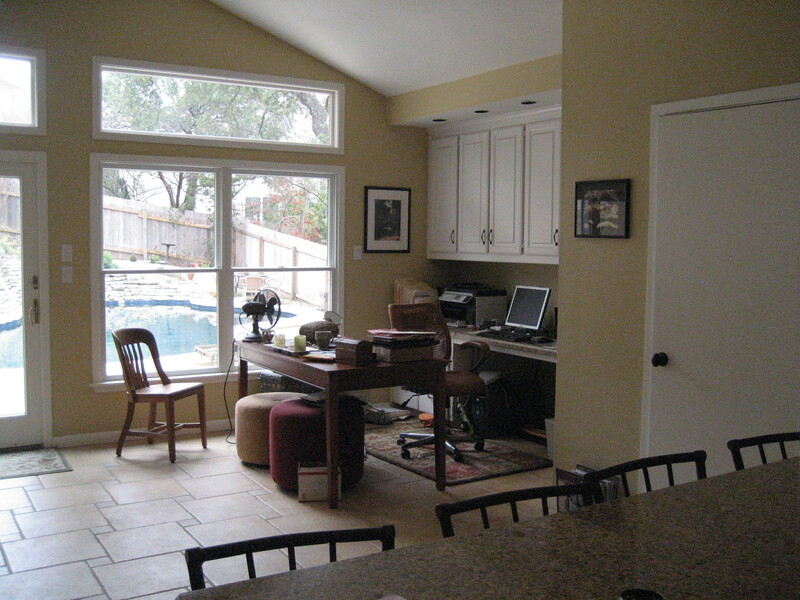 The previous owner had it split into two areas — a living area and an office. Our plan was to keep the living area but turn the office into a “library”. 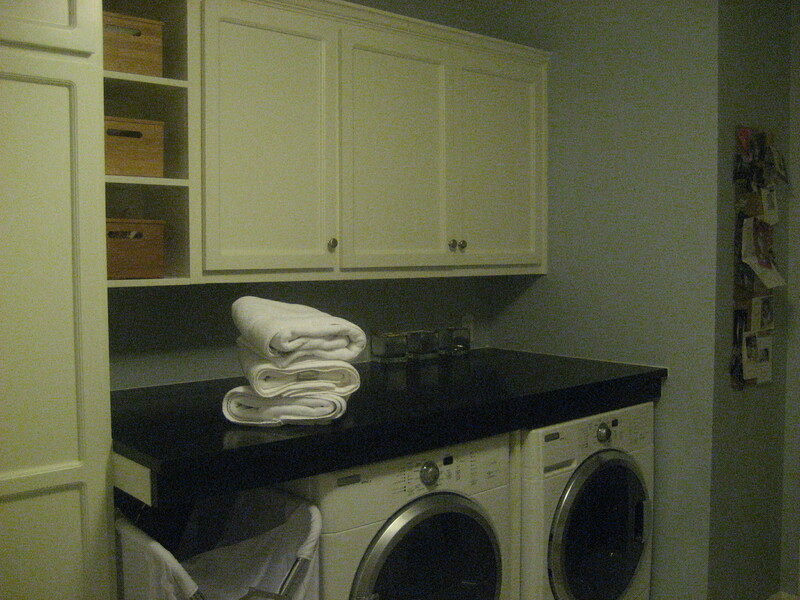 This little nook we carved out for the owners became my favorite area of the home. 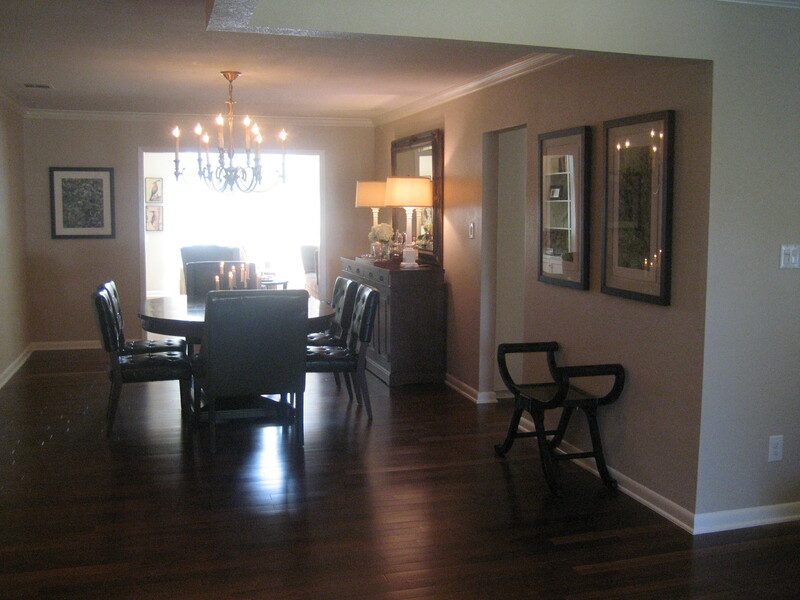 To create more warmth, we removed the tile floor and replaced with wood. 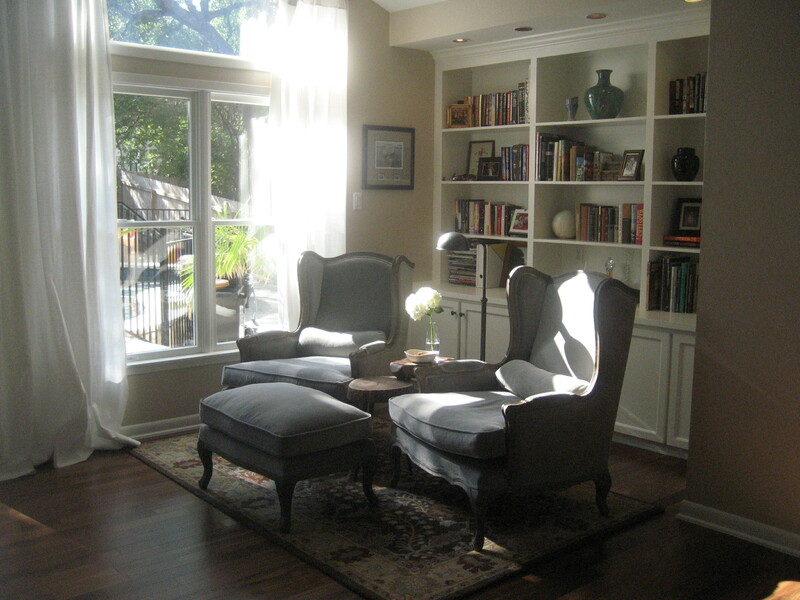 We hung curtains to frame the large wall of windows, as well as to filter the Texas sun in the afternoon. We added a section of built-ins to house their collection of books. 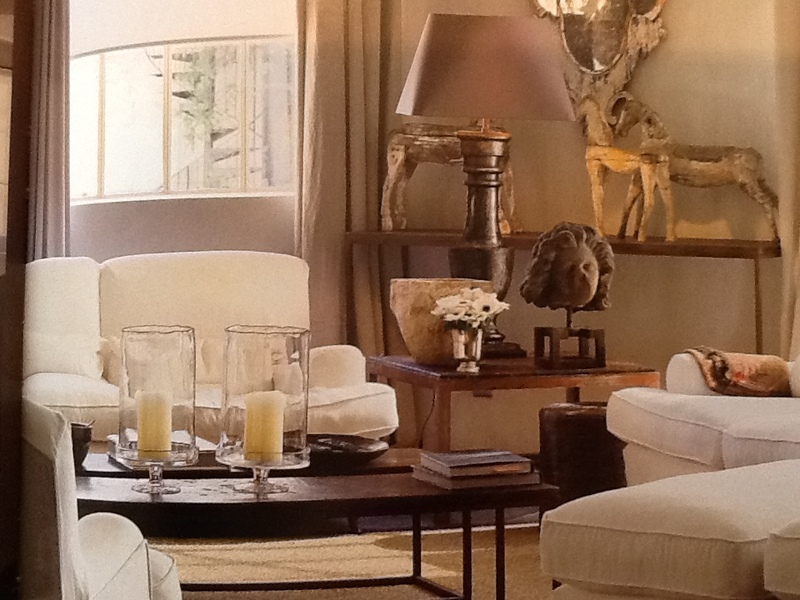 The two wing-back chairs and ottoman (in Fog) are from Restoration Hardware. 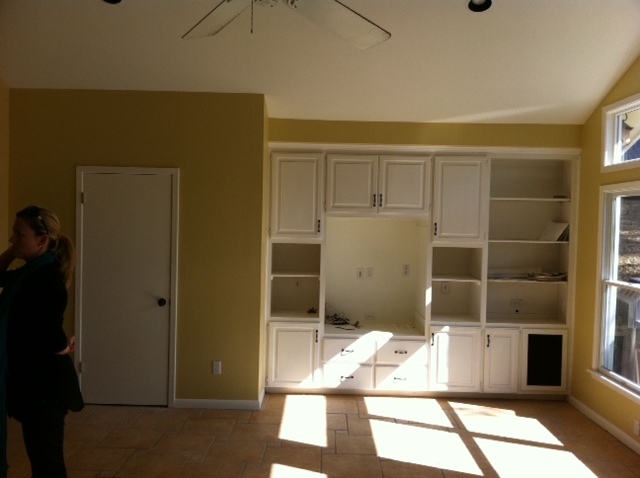 The plan here was to beef up the built-ins by removing the closet to the left. 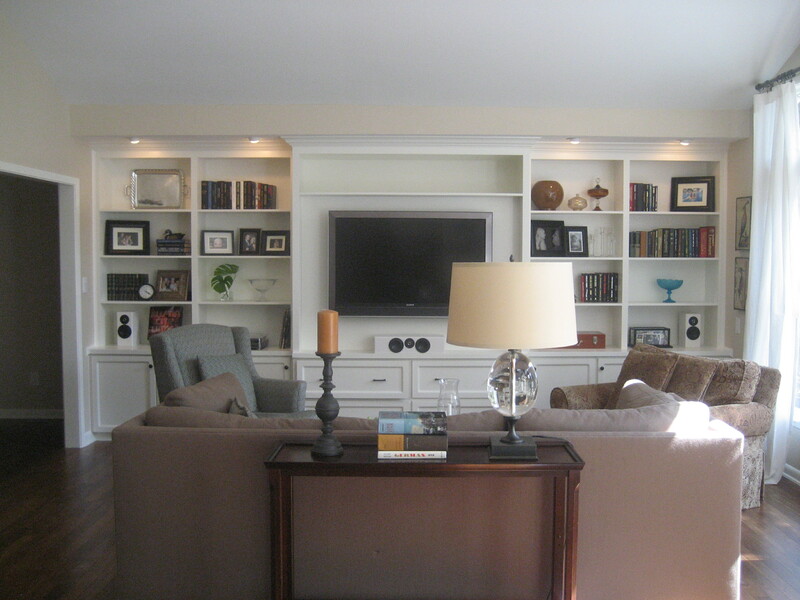 We also wanted to simplify the look of the built-ins by having only shelves on top and keeping the drawers and cabinets on the bottom. Next time, the mud room! The goal with this project was to create a casual and comfortable home with a neutral palette that would be soothing for the homeowners, yet relevant for a family of four. 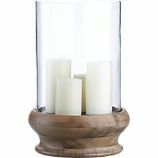 Because they were moving from a smaller home into a larger one, I knew there would be new pieces to purchase. However, to keep the new home cozy and familiar, I wanted to use as much of the homeowners’ original furniture as possible. Though there are still odds and ends that need to be done, I am finally ready to post the “after” photos. 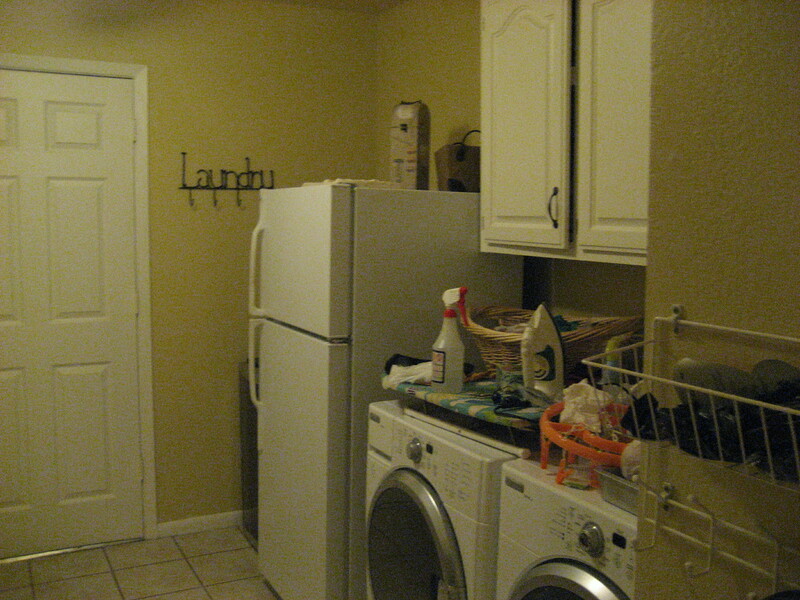 The photo above shows the original space as you enter the front door. A large atrium sits in the middle of the home connecting the dining, kitchen and formal living room. 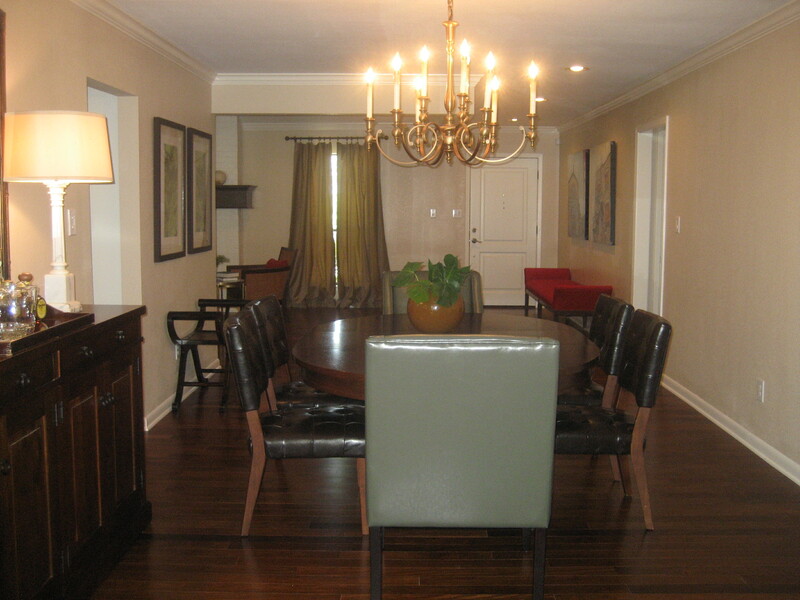 Behind the atrium is the formal dining room, and then the large family room. To the right of the atrium is the entrance to the kitchen. 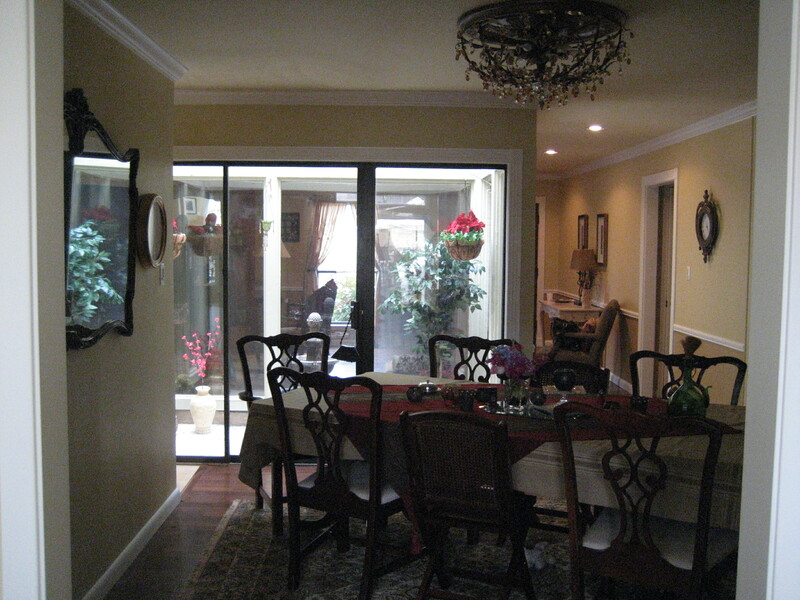 As you can see we removed the atrium, which allows for a much larger dining room and overall space to entertain. 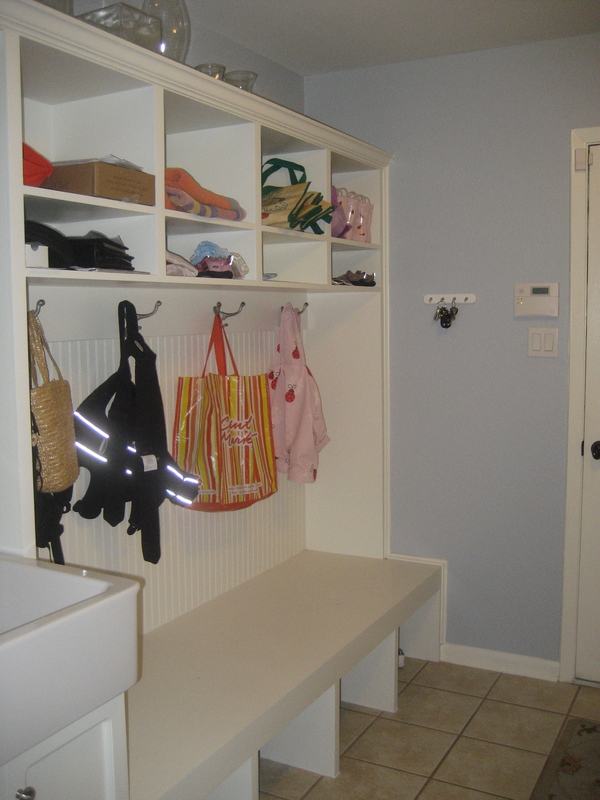 A wall was added in an “L” shape between the dining and kitchen to add a bit more privacy between the two areas, as well as to add extra storage in the kitchen. In addition to removing the atrium and adding a wall, we opened up the entrance into the family room about 2 feet to provide a better balance. Again, you can see with the removal of the atrium, the space is more open. For functional purposes, as well as to incorporate color, we placed a 9 foot red bench in the entry. The owners are still waiting for the 10 foot dining room table and a piece of art that will be placed on the wall opposite the buffet. The chandelier is from Hinkley Lighting. 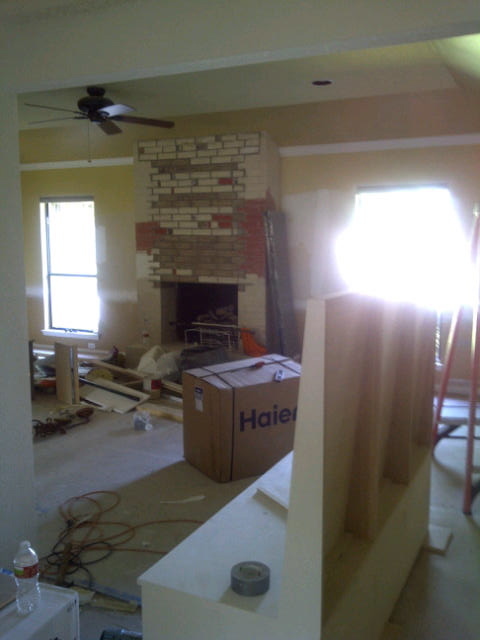 We removed the stucco from the fireplace to reveal the original brick. 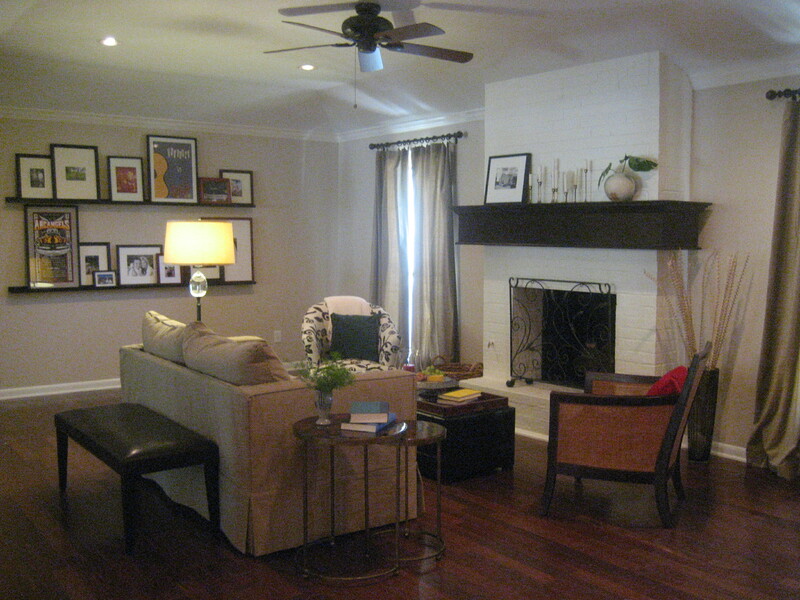 We had the fireplace, walls and ceiling painted, added a mantel and hung two large picture shelves from Ikea. Now, we’re just waiting on one large jute rug to come in and this room is done! Next time: the breakfast nook and kitchen!